I have seen these Bouncing Bet wildflowers all around but never knew what they were called until I did a little research. And I had never heard of their name “Bouncing Bet” before, so this was a first for me! 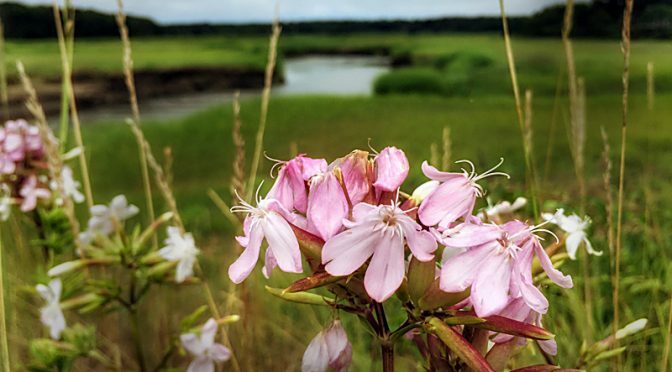 Bouncing Bet wildflowers, also known as Soapwort, have pale pink or lavender to whitish flowers with 5 petals, each having scalloped edges with an indent at the tip. The petals tend to fold back. The flowers form a cluster on a stiff stalk. They grow on open areas and roadsides, which is where I saw them overlooking Boat Meadow Creek, from July to September. So pretty, don’t you think? Have you ever seen a Bouncing Bet? Do they “bounce” in the breeze, I wonder!